The Hackensack PBA Local 9 has confirmed reports that today the City of Hackensack has signed a "Memorandum of Agreement" with the police union. The police have worked without a contract since December 31, 2012. This memorandum is a tentative agreement signed by the City which outlines the terms under which they agree to settle contract negotiations. Frank Cavallo, President of PBA Local 9, declined to comment on the specific terms of the agreement until his union votes to accept them, later this week. In a joint statement, Anthony DiPersia, the PBA Delegate, and Cavallo said, "We are thankful for the support of the City Council and the professional approach to amicably settle these negotiations by our Interim City Manager, Art Koster. We are also grateful for the overwhelming support of our officers by the residents and tax payers. We look forward to continuing to work with city officials and residents while professionally protecting and serving our community." But most important of all.... There is talk that Johnny and Rosie have made up! *Just because Rose has seemed out of touch with reality at recent meetings.... for full disclosure, this video is satire--a JOKE-- it is in no way meant to insinuate a romantic relationship between Rose Greenman and John Labrosse. Is the long awaited change here? Tuesday, the Hackensack City Council voted 4 to 1 to terminate the City's contract with Thom Ammirato, a public relations consultant being paid $78,000 per year. Mayor John Labrosse and Deputy Mayor Kathy Canestrino separated themselves from Ammirato citing personal reasons after the Bergen County Prosecutor's Office opened an investigation into Ammirato's serving multiple municipalities as a contractor while a full-time County of Bergen employee (a discovery first uncovered by The Hackensack Scoop). Rose Greenman was the lone dissenting vote. Thom Ammirato was contacted for a comment, he has declined the opportunity. This notice has come the day after Anthony Rottino filed a lawsuit against the City of Hackensack, Mayor John Labrosse, Deputy Mayor Kathy Canestrino, and Police Director Michael Mordaga. In his suit, Rottino alleges that after holding the line in contract negotiations Mordaga threatened that if Rottino did not give in to union demands the PBA would "destroy him" and "blow up this administration." Mordaga was unavailable for comment on these matters but has previously been quoted as denying all allegations. In his complaint, Rottino takes a number of cheap shots at members of Hackensack PBA Local 9. Rottino alleges that members of the police union have engaged in "widespread use of steroids," insurance fraud, and "mob-like and thuggish behavior." 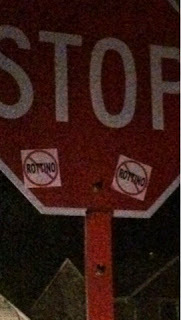 Rottino alleges that Canestrino, Labrosse, and Mordaga have created and condoned an environment where persons acting in the interests of the PBA have "been driving by [Rottino's] residence at night and placing stickers attacking [Rottino] in public places." Rottino further alleges that defendants have failed to "take meaningful steps to investigate the conduct and discipline those involved." Mordaga has previously been quoted as indicating that the number of suspects in this matter was too great. PBA Local 9 President Frank Cavallo states that these allegations are baseless and "not only self serving, but irresponsible on Rottino's part." As to the allegations of insurance fraud and "widespread use of steroids," Cavallo reiterates that it is an "absurd accusation made in desperation." Cavallo defends Local 9 stating that the "Hackensack Police Department has, and will continue to, protect and serve this community in a professional manner." Rottino further alleges that Canestrino interfered with union negotiations in an attempt to force Rottino to violate New Jersey State Law in exceeding a 2% cap on salary increases. The 2% cap only pertains to arbitration settlements. Further accusations that Canestrino's husband would personally benefit from the contract negotiations seem baseless. Emil Canestrino has indicated that as a retired officer he does not receive any benefits, not even health insurance, from the City of Hackensack. Public records indicate that Canestrino (from the City) merely receives an annual reimbursement of his Medicare premium, as do all officers who were covered under his contract. Perhaps these "misunderstandings" are further proof that Mr. Rottino does not understand Municipal Governance and isn't the man for Hackensack. He was retaliated against for his input on the hiring of a Municipal Judge. This hiring was done prior to Rottino's employment by the City of Hackensack. He has been falsely accused of improperly granting his friend Frank Catania health insurance. However, public records show that the insurance was granted AFTER Rottino became City Manager. He was defamed when Canestino told Council Members Battaglia and Greenman that he is a "drug dealer." Battaglia has publicly stated that such representation was never made to him. Though Labrosse declined to comment on much of the complaint as the matter is pending litigation, he did note that the accusations are baseless and that this is an ugly situation. Labrosse went on that it is nice to see members of the community coming together. He explained we are in a bad way right now, but people are coming together for the betterment of Hackensack. He likened the situation to a car accident. It isn't good, and we all hope that everyone will be ok, but people are coming together and "stopping to help." During public comment, residents expressed anger and outrage over the Council's hiring of political cronies. Many went on to call for the replacement of other political appointments such as the Municipal Prosecutor who has (subject of great controversy) been given health insurance benefits. Jason Nunnermacker cites an arrest in Catania's past for possession and intent to distribute drugs. Nunnermacker indicated that he was reading from public documents when he shared this information with the Council. Former City Attorney and Municipal Prosecutor, Richard Salkin, took on Rose Greenman for alleged violations of local zoning ordinances. He cites that Rose Greenman has listed her apartment on Prospect Avenue as her business address. According to local zoning ordinances, offices in her building must not be above the second floor, and she must have four parking spaces designated for her office. Her apartment/business is on the fourteenth floor. Greenman did not reply to questions about whether or not she has four dedicated parking spaces. Salkin provided documents to Art Koster, Assistant City Manager, and asked the matter be immediately addressed by our building department. Members of the public, and the Council, applauded CFO Jim Mangin for a professional and thorough budget presentation. They seem to have gotten this hire right. Imagine what he could do if he had a strong, qualified, City Manager to work with! I can only hope that this Council has learned a valuable lesson about political patronage. It appears by their termination of Thom Ammirato this evening, and their calling of a special meeting on Thursday to presumably discuss Anthony Rottino's future employment, that they are attempting to get back on track and finally live up to their campaign promises. I by no means condone, forgive, or forget the actions of this Council in the last eleven months. However, I have urged all of the members of the public to press pause and support the Council as they address this issue--it is clear that they are addressing it. As I told the Council this evening, their future actions will continue to be subject to strict scrutiny, but for today--let's fix the problem. The Hackensack Rotary held its annual scholarship luncheon at Rudy’s Restaurant on Thursday, June 12, 2014. Scholarship awards totaling $21,250 were presented to twenty worthy applicants. The Hackensack Elks, in cooperation with Community Blood Services, will be hosting a blood drive on Saturday, June 28th, from 9:00 am to 2:00 pm at their lodge (37 Linden Street). For every donor who registers to give blood on June 28th, Community Blood Services will donate a dictionary to the Elks' "Dictionary Project." The Dictionary Project was founded in 1995 by Mary French of Charleston, SC. The project focuses on promoting literacy to children in third grade. Since 1995, the program has given nearly 15 million third grade students dictionaries. 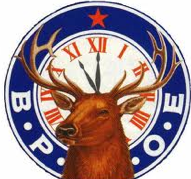 The Elks joined this movement in 2004 and nationwide have donated more than 1.2 million dictionaries. 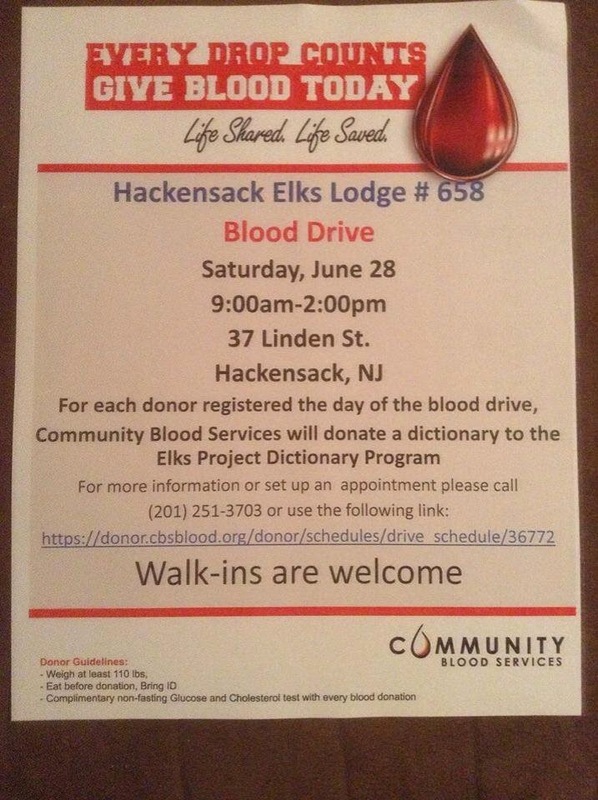 Come to the Hackensack Elks Lodge (37 Linden Street) on June 28th to not only help our local blood banks but to help promote literacy in our public schools! HPD receives first lead in "Sticker-Gate"
The Hackensack Police Department has received the first lead in the continuing investigation dubbed "Sticker-Gate." The "Sticky Bandit(s)" have been applying Anti-Rottino stickers (pictured below) to anything and everything around the City of Hackensack. It is reported that stickers have appeared on stop signs, utility poles, storefronts, and even Art Koster's city vehicle. 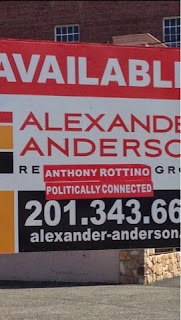 Other Anti-Rottino type stickers (pictured below) have appeared on various real estate signs throughout the city. The suspects have been described to police as two black males in their early twenties. They are each approximately 6 feet tall, one with a medium build and the other a large build. The suspects were seen applying stickers to the Welcome to Hackensack sign at Main Street and Route 4 East. When seen, the suspects fled to the rear of an apartment building on South Lake Drive. As always, anyone who sees suspicious activity should contact Hackensack Police at 201-646-7777. Today, the Hackensack Volunteer Ambulance Corps. (HVAC) hosted a blood drive, barbecue, and vehicle extrication demonstration for the public. Members of the Hackensack Fire Department were present to demonstrate the safe removal of a vehicle from around a person who has been involved in a motor vehicle accident (extrication). The Fire Department demonstrated the use of chocks and other stabilization equipment for bracing of the vehicle and the use of hydraulic tools such as the "Jaws of Life." The HVAC demonstrated how to perform patient triage and initial medical assessment, then remove the victims from their vehicles. The Community Blood Services were present for donations of blood.